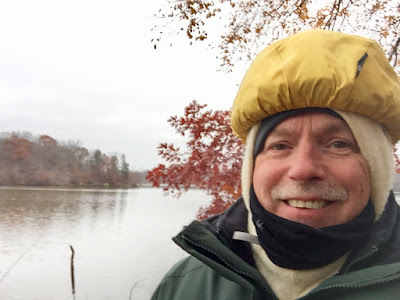 A ride around Indian Lake the day before snow arrived. I walked after that. When I bought a tiny trailer, it was actually a huge, lavish increase of hauling capacity from my bicycle camping experience. Carrying food, water, and all camping and living gear on a bicycle is possible, but one has to be discriminative and uncompromising. The alternative is to be standing on the pedals, pumping up an Iowa hill, and then have the thought, "I didn't really need that five hundred page hardback book after all." Even car camping with the tiniest trailer still allows for a tow vehicle powered by more than legs, and the capacity to carry much more cargo. A grocery run commute with the Burley Travoy trailer. I have a Burley Travoy trailer that I've taken on camping trips a couple of times. It works well, but I mainly use it for commuting around town to buy groceries and sundry. Hanging panniers from my bicycle, though, is what I've been using the last few years. 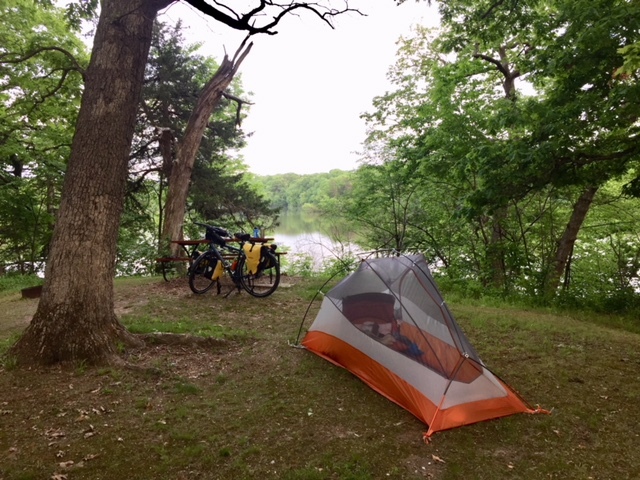 Now that I own a tiny camp trailer with a rear bicycle rack, this next camping season will unfold a different kind of bicycle camping experience for me--setting up a basecamp at a campground that has bicycling opportunities for day rides. I did a little of this last year at two campgrounds and enjoyed the ability to explore beyond walking distance of the campground. This is the most efficient set up for traveling, I've found. In terms of touring by bicycle, I prefer shorter, local tours that allow me to take off for a few days but not to be gone too long from my family. One of my favorite tours that I plan to repeat this next season takes four days but is only around 100-120 miles, with no more that 25-35 miles per day. This 4-day trip is one that takes me to the areas I also tiny trailer camped last year: Oakland Mills, Indian Lake, Bentonsport, and home. I've ridden this route about three times, varying the route and campgrounds slightly each time. 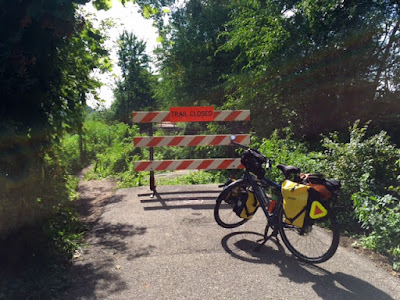 This route includes both pavement and gravel through forest stretches and along the Des Moines River--and, of course, lots of pedaling beside fields of corn and beans! Indian Lake, my one-person tent without the rain cover put on. 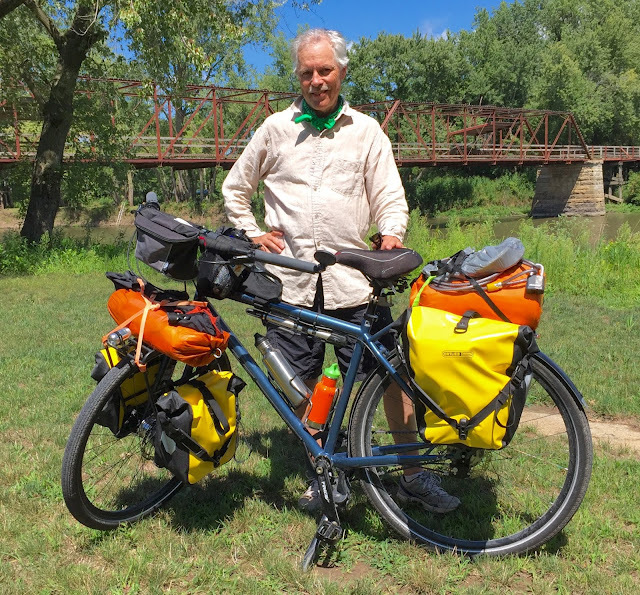 Another favorite trip I've ridden twice is the Cedar Valley Nature Trail, a rails-to-trails lime chip trail from Waterloo to Cedar Rapids, Iowa, around sixty miles. I've ridden this twice, continuing on south from Cedar Rapids to Iowa City. The trail exists in a strip of land about thirty yards wide, usually with farmland beyond. It also passes through the little towns of the area. I also enjoy taking a trail the continues through Cedar Rapids, riding the trail through the town, on a bike yet still separate from the city traffic. There are always detours, though--one bridge has been washed out for years, sometimes there is a detour because the lime chips are being converted to tarmac, sometimes flooding takes its toll on the route, and once I just had a tree down across the trail. They were all manageable and part of the adventure! A washout on the CVNT. It was dry enough to walk the bike through. Tiny trailer camping will provide more of a "hub" for my bicycling, whereas for touring the experience is more linear. 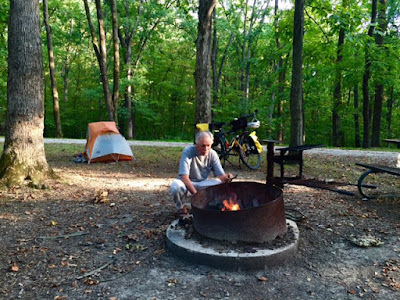 The possibilities for day rides from a basecamp include many of the bicycle trails that exist in Iowa, including the trails that circle two of Iowa's biggest lakes, Lake Rathbun and Lake Red Rock. These trail rides (some paved) include destinations to towns or even to a resort for a meal, in addition to pleasant rides along the lake and on grassy trails through state parks. Bike rack behind the trailer with the bike mounted. My big plan is to travel to Indian Lake in Farmington. I camped there twice last year, once with a tent in the early summer, and once in the fall with the Green Goddess. What I would like to do is camp at Indian Lake and then take day rides into the Shimek Forest. There are plenty of gravel roads in the area and trails for hiking, biking, and horses. I think that should be a lot of fun. Bitternut Campground. A primitive site, quite woodsy. I spent one night in a primitive campground called Bitternut Campground in Shimek on my last trip through the year before last. "Primitive" means no water or electricity. What is available is a pit toilet, a camp table, and a fire ring. The plus side is that I felt like I was really in the woods and not a park--nature felt closer and civilization a bit farther away. This is hard to find in Iowa where although there are not a lot of people, they're pretty much spread out on farms and such. "I did a little over 100 miles today," he said. "Yes, sir," I said. Tiny trailer camping still seems like a step up in extravagance--"Sure, I'll just throw that in, since I've got the space." I can do that and not feel the pain thirty miles later. I take it easy, reminding myself that I am deliberately choosing to not over-extend myself. I remember one overnight trip to Lake Darling, seventeen miles from home. I had arrived and set up when a gray-haired man pulled on his bike. We chatted a bit and he asked me where I was from. I explained that I was from close by and then asked about his travels. 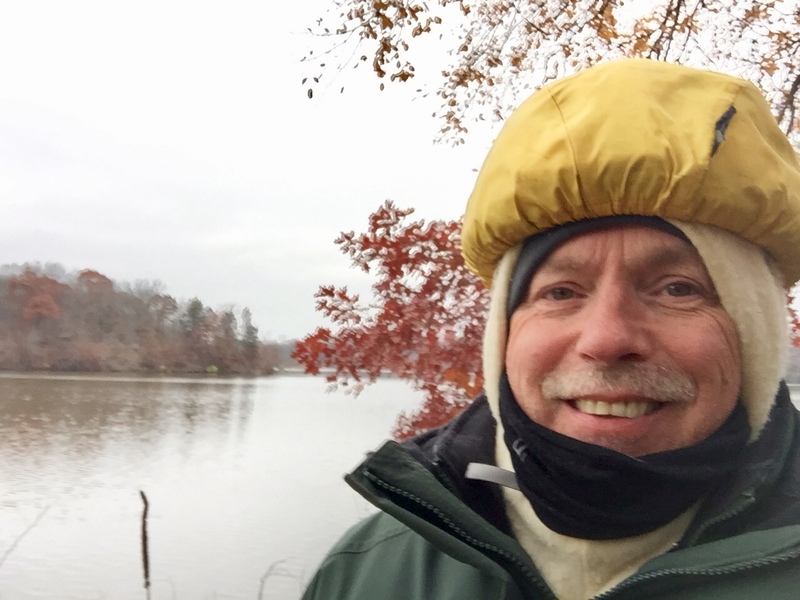 He was traveling north from Alabama--and that day had topped one hundred miles. He was an old hand at long hauls, though, and it was fun talking to him. Whether traveling by tiny trailer or by bicycle, there is a joy in lessening our impact on the environment. I know that everybody can't travel by minimalist means, but for those of us who can and want to, it's a reward in its own right. This spring I expect I'll be traveling and camping, either with my tiny trailer . . . or with my extremely tiny trailer (or panniers). Yes, it's a bit more work by bicycle, but I can say without hesitation that the gas mileage is fantastic! I hope some of you readers leave comments about how you integrate bicycles into your camping experience. Believe it or not, I used to bike a lot up in New England. Yes, I did a few extended trips with the packs, panniers and the bike loaded to the hilt. Later, I just did loops and Vermont has some amazing loops from a dozen miles to hundreds of miles. I have biked around Lake Champlain and numerous double Green Mountain centuries. We are securing a new camper in the next month or so and will have a bike rack on the back. No more centuries for me but perhaps a little bit of the joy will return that I enjoyed so many years ago. I only went out once last year on an overnighter. I'm lucky in my area to have many campgrounds, so from my front door I can spend four nights out and travel between 20-30 miles each day. That way I can enjoy myself even if I'm not in top shape. The farthest I've ever traveled in one day was 55 miles, so your experience has got me all whipped, Jim! 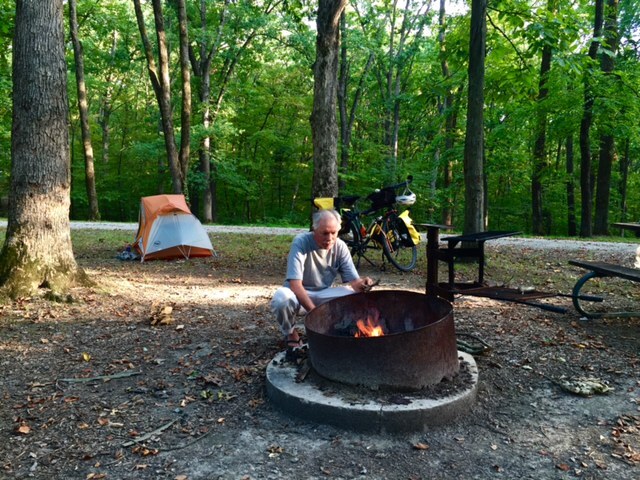 The experience of bike camping includes quite a lot of freedom. We get so used to traveling with an engine providing the energy. Doing it with our own muscles is very rewarding for me, and I want to enjoy the opportunity while I have it. Thanks for responding. The area you traveled in is quite beautiful, I've heard. My wife has clients she visits in Vermont in the Brattleboro area, and she says its gorgeous.